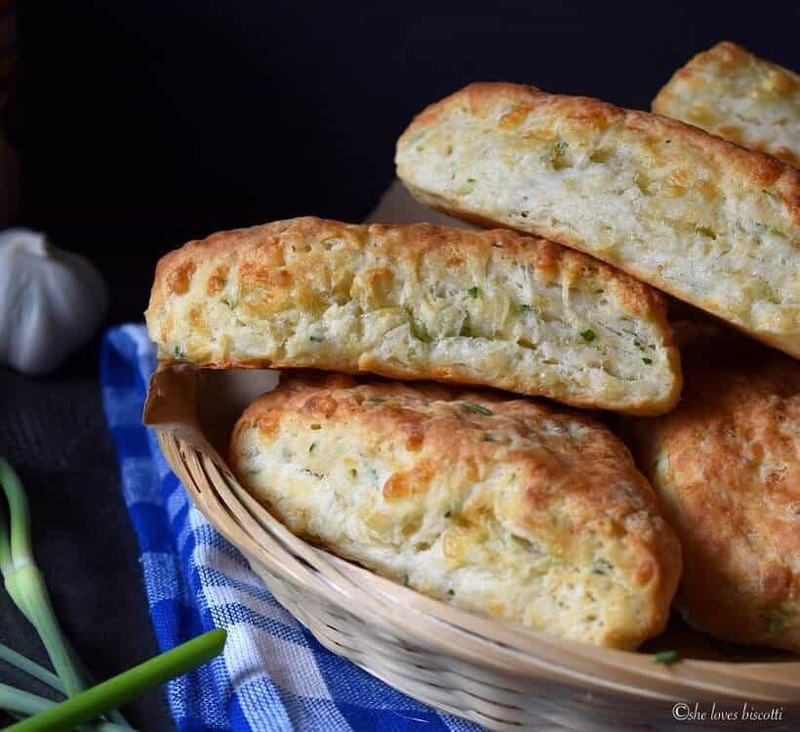 One of the secrets to the best tasting garlic biscuits is using garlic scapes! The other is grating your butter. For those of you that have no idea what I am referring to, you, my friend, are in for a very special treat. They are brilliant green in color and emerge as twisty and curly flower stalks from the bulbs of hardneck garlic. Unfortunately, fresh garlic scapes are only available for a couple of weeks -usually very late spring to early summer. Last fall, I planted some certified organic Italian Porcelain Hardneck Garlic, ordered online from Boundary Garlic Farm (not sponsored). I could not have been happier to see that my garlic had survived a very wet spring. As a result, I now have garlic scapes to enjoy! A young garlic scape is very tender. 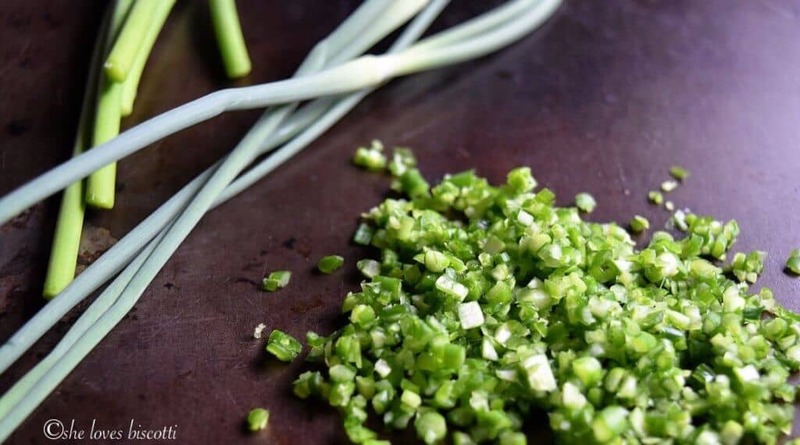 It can be consumed much like chives or green onions -which is to say, raw and chopped up finely. It can then be sprinkled on your favorite Chickpea Summer Salad, in dressings or in dips -or even on this Egg Drop Soup! You would probably not be surprised if I told you that garlic scapes have a mild garlic flavor without that signature pungent quality. As the garlic scape matures, it becomes a little bit more fibrous and tough. At this stage, the scape can be consumed much like sautéed garlic. They are absolutely great in stir fries! 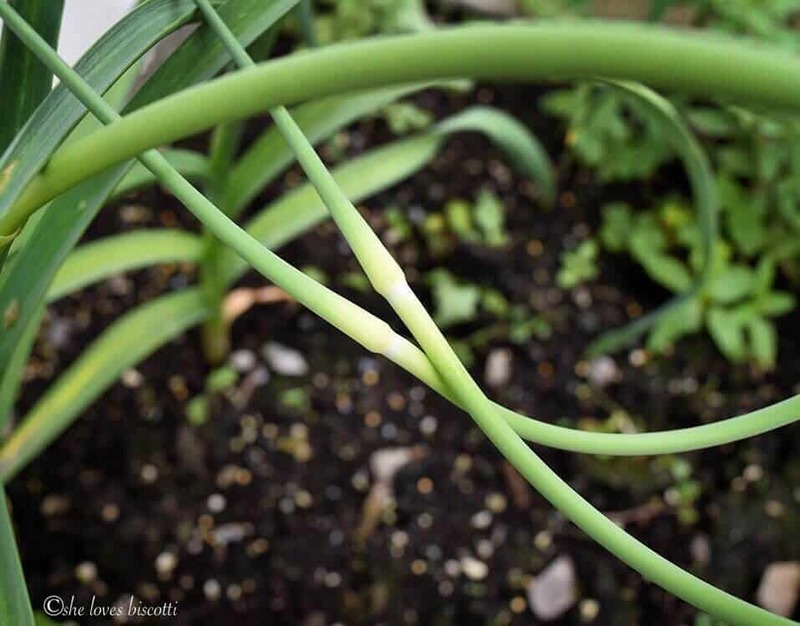 If you planted hardneck garlic, and have garlic scapes, it is advisable to remove them so that the plant directs all of its energy to growing the garlic bulbs. Simply cut the garlic scapes off the plant and refrigerate them. They will keep for a couple of months in a plastic bag. 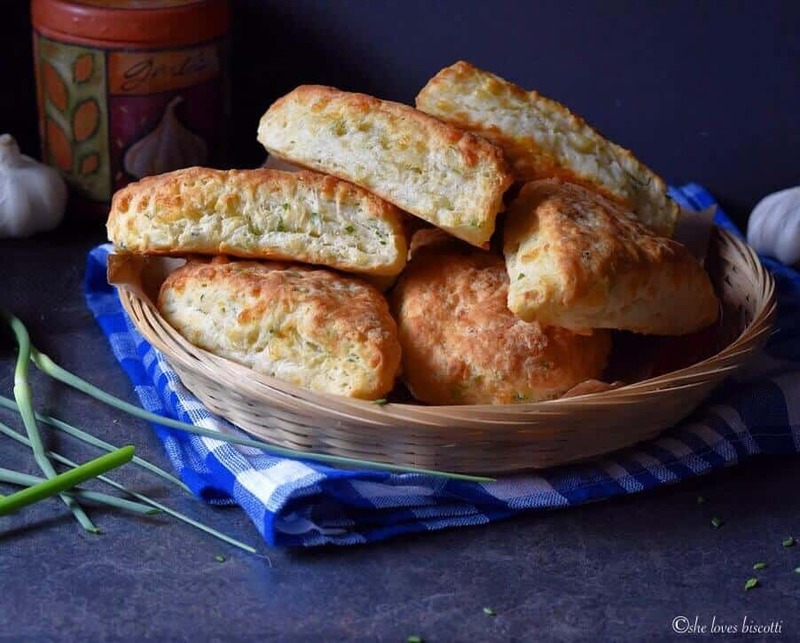 Today, I would like to share with you one of my favorite ways to have garlic scapes -biscuits! 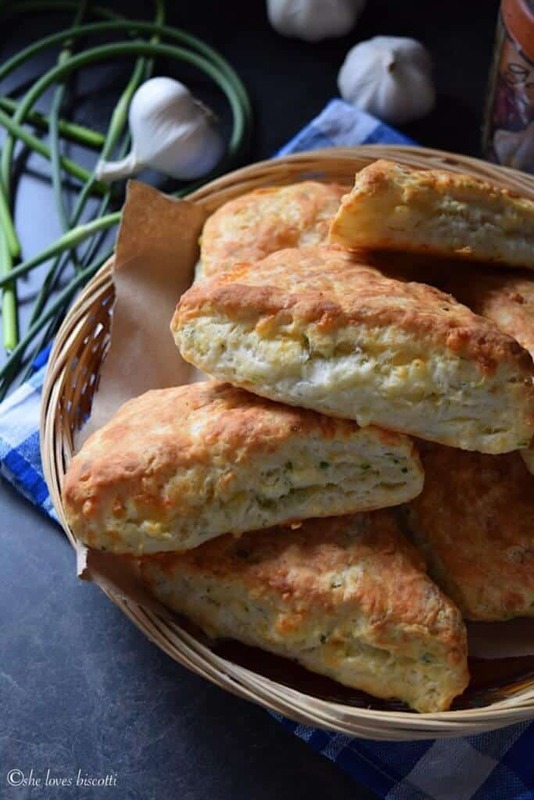 Is there anything better than biting into freshly baked biscuits that are better than those Red Lobster cheddar biscuits? You might be thinking that cheese biscuits are complicated to make. Nothing could be further from the truth. In just a few simple steps, you can make the fluffiest, best tasting biscuits. Are you ready? In a medium-size bowl, whisk together the dry ingredients. 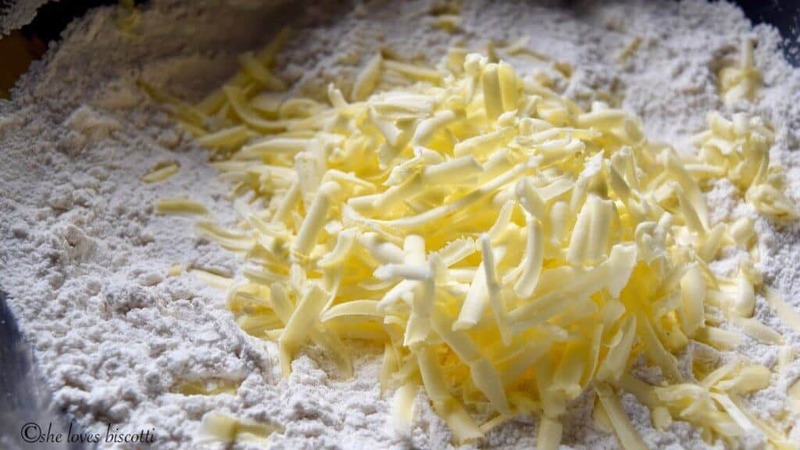 Using a cheese box grater, grate frozen butter over dry ingredients. Toss gently to incorporate the butter. 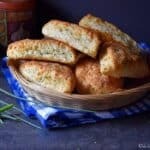 Tip to get fluffy cheese biscuits: Many years ago, I saw an episode with Chef Michael Smith where he incorporated frozen grated butter with the dry ingredients to make his biscuits. No double knife method and no pastry cutter… I thought this was a genius idea! This method also ensures very fluffy cheese biscuits. Once the grated butter has been well incorporated, add some finely chopped garlic scapes, three to four depending on personal taste. What if I don’t have garlic scapes? No problem, you can still enjoy these great cheese biscuits! A great garlic scape substitution is garlic chives, you would need about 1/4 cup. Next up, the cheese. 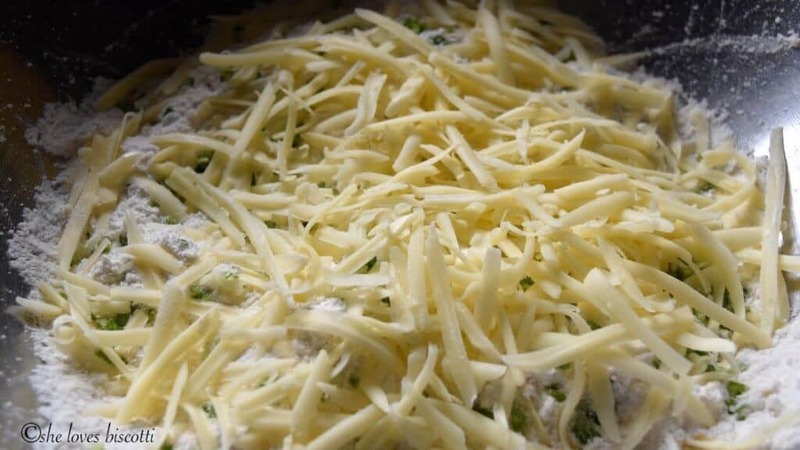 Add some grated cheese and gently combine. A sharp cheddar cheese, mixed with a little Gruyere or even mozzarella works great in these Cheese Biscuits. I will usually use whatever cheeses I have in my fridge. Now it’s time to make a well and add the buttermilk. Mix until the dough just barely comes together. 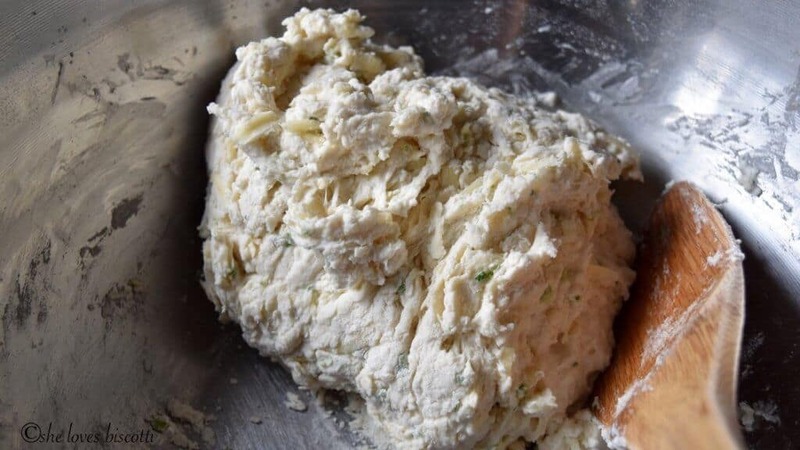 In actual fact, you will notice that the dough comes together rather very quickly. 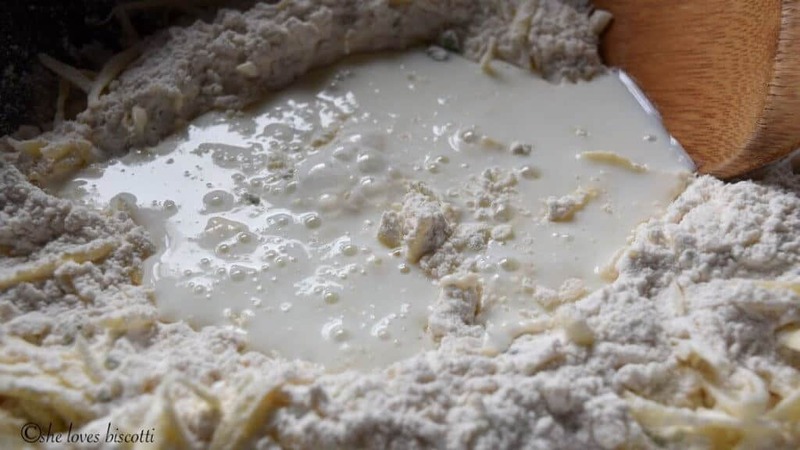 It is now time to transfer the dough to a floured wooden board and knead gently 4-5 times. Then, with the help of a rolling pin, apply very gentle pressure to roll out the dough to an oval/round shape approximately 1-inch thick. 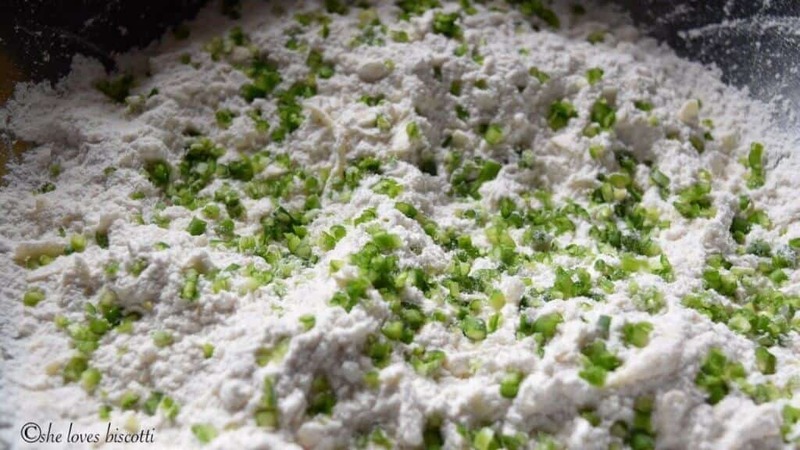 Try not to over-manipulate the dough, as this will result in a very dense biscuit. 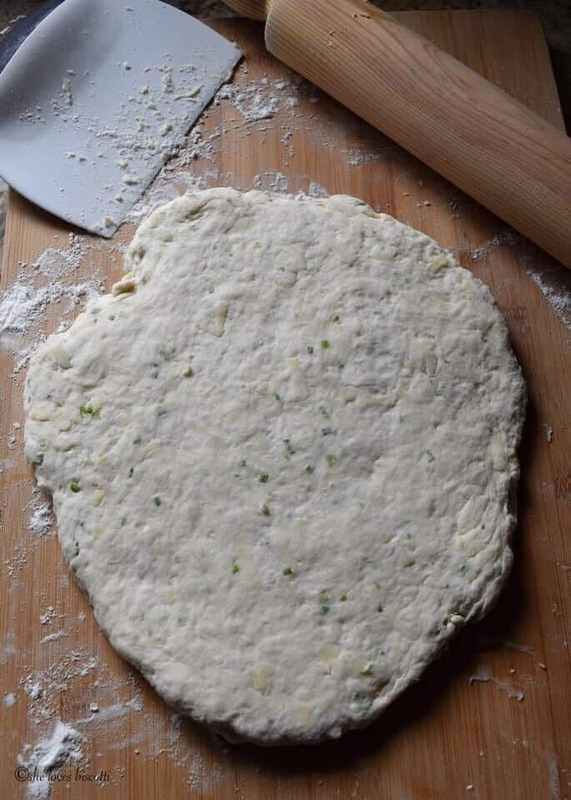 You can also pat the dough into the desired shape. Don’t worry if it isn’t the perfect shape. What’s important is to get your biscuits in the oven as quickly as possible with the least amount of manipulation. 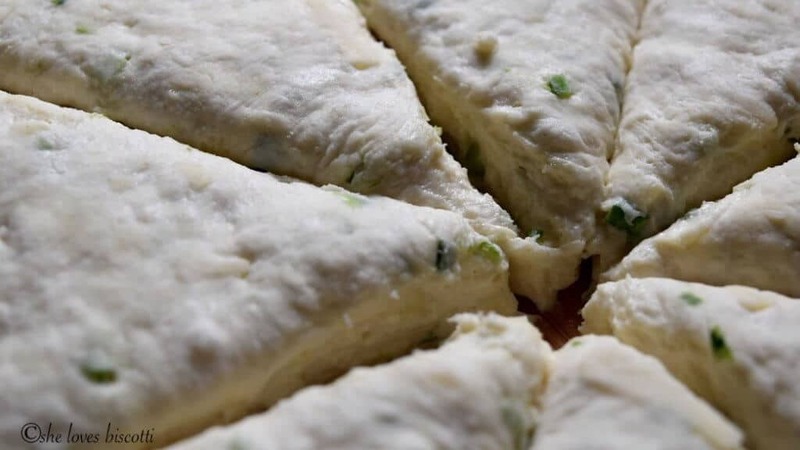 With a with a very sharp knife, cut the dough into eight wedges. Transfer to a parchment lined cookie sheet and bake in a pre-heated oven for about 15-20 minutes. 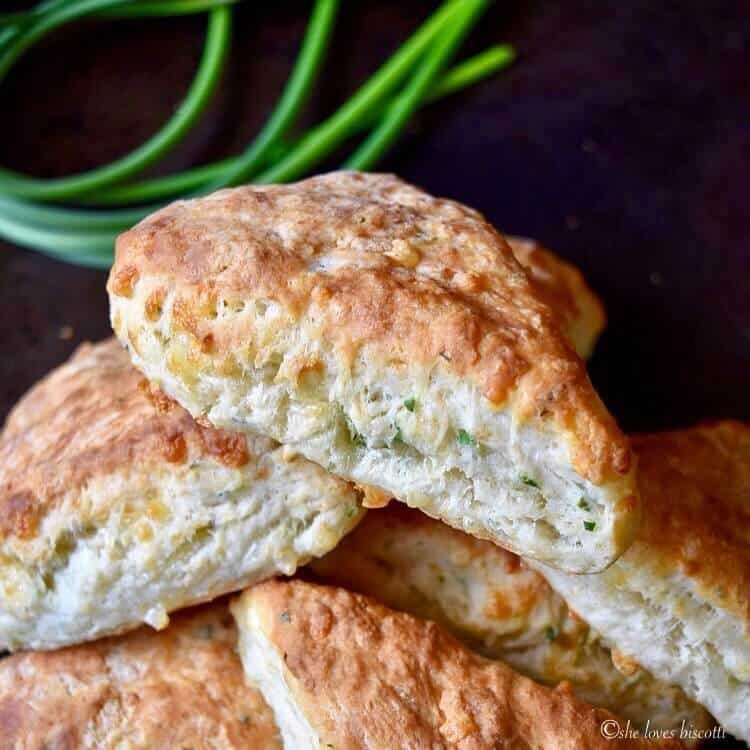 Before you know it, you are biting into warm, Fluffy Garlic Scape Buttermilk Cheese Biscuits -a simple and fresh tasting savory biscuit that is guaranteed to be appreciated by all. I love this recipe for Buttermilk Biscuits. It’s my go to buttermilk biscuit recipe I adopted from Alton Brown many years ago. 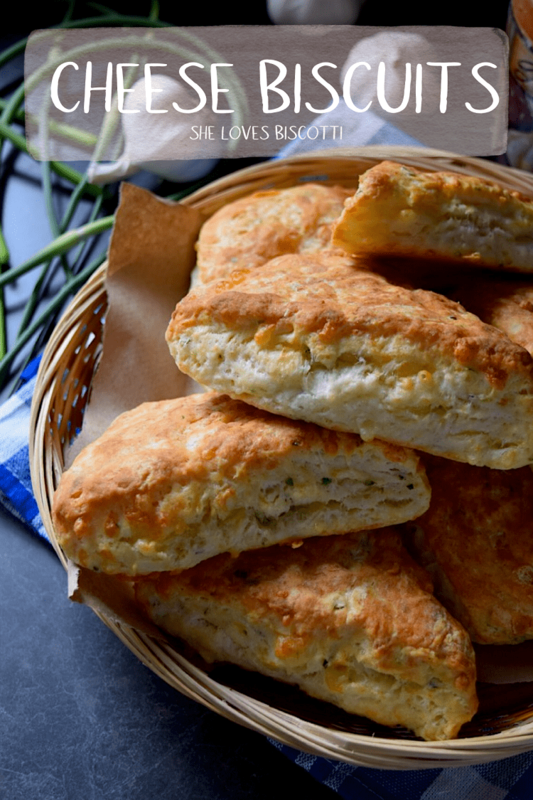 There are truly endless variations to this recipe and today I am sharing a garlic cheddar biscuits version with all of you. 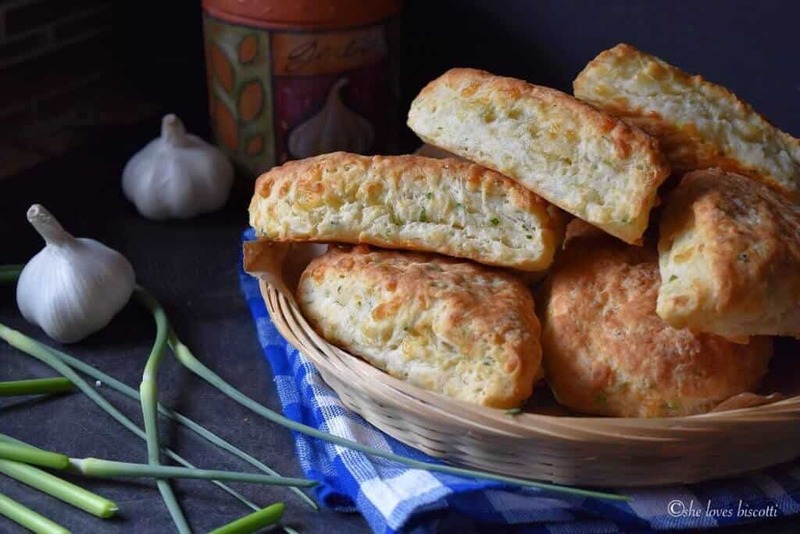 These savory biscuits are an easy side dish to make throughout the year. One of my favorite dishes to serve it with is this Corn Potato Chowder. What would you serve these cheesy biscuits with? ★★★★★ If you have made this cheese biscuit recipe, I would love to hear about it in the comments below and be sure to rate the recipe! Using a cheese box grater, grate frozen butter over dry ingredients. Add the garlic scapes and cheddar cheese and quickly combine together. Knead gently 4-5 times and then pat into a 1-1½" thick rectangle or round/oval. Can also use a rolling pin. Bake for 15-20 minutes or until fluffy and golden brown. You can substitute the garlic scapes with 1/4 cup of garlic chives. Just love this idea and why not biscuits. I had never cooked with garlic scapes but look forward to doing soon now that you have opened my eyes. I just cut 100 scapes in my garlic patch. I never thought about adding them to biscuits! Great idea. Allo Maria, j’ai cuisiné ces délicieux scones cet après-midi. Tes explications sont très claires. Grazie e un abbraccio !! Maria dear, this is going to be my breakfast today ! Grazie mille ! Ciao !